There is a lot of anguish about the low visibility of women in economics: A list of the most influential economists in The Economist included no women; Justin Wolfers showed how the media gives credit to male rather than female coauthors; Tim Harford noted the proportion of women studying economics in the US has not improved and is falling in the UK; and the AEA held a session today on helping women improve their profile in the media. The “#ilooklikeaneconomist” hashtag was an attempt to correct the overwhelming predominance of images of men in response to the search term “economics professor.” But “economist” and “economics professor” are not the same thing, and women economists have made important contributions outside of academia. I have written elsewhere about some of the challenges women economists face in the policy world. Here are some of the women policy economists who have inspired me along the way. Ida joined the Social Security Administration virtually from its inception (1936) and worked her way up to head of the research department, where she was a strong and effective advocate for the program. While her knowledge was encyclopedic, her explanations were always simple, clear, and data-driven. 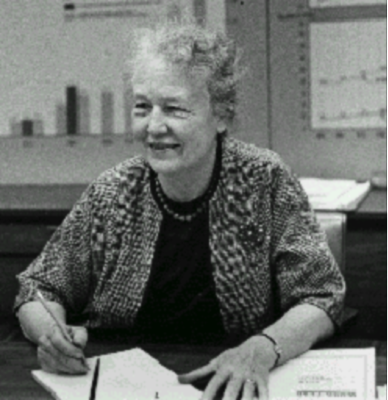 Judith is one of the pioneers of randomized control trials (RCTs) in the social sciences. As director of research from the founding of MDRC (1974), and then president (1986-2004), she was at the forefront of figuring out how to bring RCTs out of the lab and into the world of US policymaking. As she explains in her book Fighting for Reliable Evidence (written with Howard Rolston), this fight was primarily fought by policy economists, with very little engagement of academics until the late 1990s. Her lessons on how to convince agencies to randomize are well worth reading, including for those working in developing countries. There were very few women economists and even fewer senior women economists when I started work at the UK Treasury in the 1980s. Rachel Lomax was a prominent exception. She went on to be vice president at the World Bank, permanent secretary of Welsh Office, Department of Work and Pensions, and at the Department of Transport, as well as being deputy governor of the Bank of England. As a boss she was both intimidating and inspiring. More than any other senior bureaucrat I have worked with, she pushed us to stay current with the latest economic literature and make sure our decisions reflected the latest research findings. Knowing that she miraculously found time to be current with the literature was a very strong incentive for us to do the same. I had the privilege of supporting Mozambique through the write-down of much of its bilateral and multilateral debt in 2001 as part of the Highly Indebted Poor Country Initiative. Mozambique was only the second country to reach this point, in large part due to the sound economic management of the then-Minister of Finance Luisa Diogo, who got her master’s in economics from the University of London and went on to become Mozambique’s first woman prime minister. As the only female member of the IMF negotiating team, I loved to watch then-Minister Diogo dominate meetings through superior argument as well as force of personality. She would heap withering scorn on poorly thought-through proposals (including from her own central-bank governor). The result was that everyone went into meetings with her very well prepared. As prime minister, Madame Diogo used her formidable intellect and reputation to push for free reproductive health care and gender equality across the African continent.